Cavan had three players sent off yet still earned a 2-8 to 0-11 win over Armagh in a fiesty Dr McKenna Cup opener at Crossmaglen. Armagh finished with 13 men themselves after the second-half dismissals of Aaron Findon and Brendan Donaghy. David Givney and Joshua Hayes received first-half straight red cards as Niall McDermott and Chris Conroy goals helped Cavan lead 2-6 to 0-3 at the break. 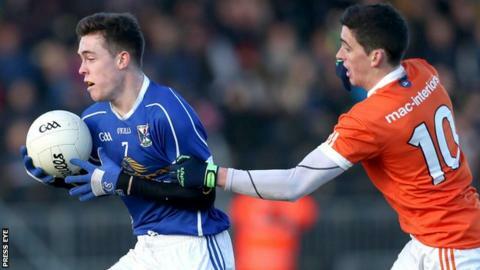 Killian Brady was sent off late on as Armagh's 16 wides helped Cavan hang on. In addition to the five red cards, referee Barry Cassidy also handed out four yellow and two black cards as the two teams served up another bad-tempered clash following the pre-match brawl which overshadowed their Ulster Championship game in 2014. Sunday's game was the first of three meetings between the teams in 2016, with a league contest to be followed by an Ulster SFC tie in May. Givney, on his return to Breffni colours after opting out last year, received a straight red card in the sixth minute after the referee ruled that he had elbowed Michael Murray. McDermott nailed the opening goal a minute later and Conroy buried a second in the 18th minute, before Hayes was sent-off for an off-the-ball foul in the build-up. Armagh kicked 16 wides, eight in each half, but were particularly poor in the opening half when they failed to score for 26 minutes and also lost full-forward Andrew Murnin to a black card. The Orchard men improved in the second half with Gavin McParland, Stefan Campbell and Ethan Rafferty on target. They got the deficit back to five points with 13-man Cavan visibly tiring. However the pendulum swung again when Findon and Donaghy were sent off by referee Cassidy. Charlie Vernon's black card challenge on Ciaran Brady sparked an ugly fracas and when tempers calmed down, Findon went for two yellows and sub Donaghy was given a straight red for wrestling with Tom Hayes on the ground. Cavan recovered their composure and soaked up the pressure with 12 men behind the ball. Killian Brady became the fifth player to see red in the last minute. Also in Section C, late goals from Derry forward Cailean O'Boyle and Mayo man Evan Regan sealed a deserved 2-16 to 1-9 win for Ulster University over an under-strength Monaghan side. Two points from debutant Barry McGinn helped the Ulster champions lead 0-3 to 0-2 but O'Boyle, Conan Grugan, Stephen Sheridan and Donegal star Ryan McHugh were on target as the Jordanstown outfit fought back to move 0-8 to 0-4 ahead by half-time. A McGinn goal cut Ulster University's advantage to 0-9 to 1-5 midway through the second half but the college side dominated the closing stages as the O'Boyle and Regan goals sealed their emphatic success.